Before I ventured out to Seattle last month for IFBC (International Food Bloggers Conference), I spent some time deciding what sessions to attend. When I came upon the Saturday session with Franciacorta, I didn’t even need to think another minute about it. I knew immediately I was Getting Bubbly with Franciacorta at IFBC! I love bubbly, of any and all varieties… champagne, sparkling wine, prosecco, methode champenoise, cava, you name it, I’ll sip it. (Seriously, give me some.) So, I knew this was going to be one heck of an afternoon… getting to learn about Italian sparkling wine, paired with some bodacious bites, while getting to know fellow foodies. Perfect! Franciacorta is located 40 miles east of Milan, and has become an integral part of Italian culture and lifestyle. Franciacorta is Italy’s first wine produced in the traditional method of re-fermentation in the bottle, as well as the first sparkling wine done in this method to obtain Italy’s highest quality designation of DOCG. Made with Chardonnay and Pinot Nero (Pinot Noir) grapes and up to 50% Pinot Bianco, there are a plethora of styles to suit a variety of tastes and seasons. Seriously, there is a bubbly for every palate. As I mentioned, we had the opportunity to taste various varietals and they were each paired with exquisitely matched bites. Luckily (for me) some of my tablemates weren’t oyster enthusiasts, so I got extra, woohoo! Oh boy, was I ever excited to see some sparkling rosé on the lineup. It’s my go to right now (has been for a while) and I knew I was going to enjoy the options Franciacorta had to offer. I must also point out that I was with the most hysterically fun group of ladies. I went for a seat at the back table as soon as we go into the room. Everyone asked why I didn’t want to sit up front, but I looked for where we’d be closest to the bottles. A girl needs her glass refilled! Although our belly laughs may have meandered their way to other people’s air space, we were so engaged and excited to learn more about Franciacorta sparkling wines and sampling all the bites and bubbles. 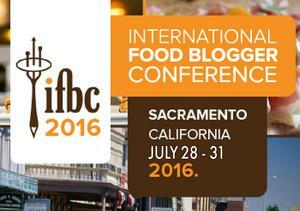 It is safe to say, this was my favorite session of IFBC this year. I hope some day to get the chance to visit the Franciacorta vineyards and learn even more about the glorious grapes. But for now, I’ll have to sip on my memories of a wonderful afternoon.